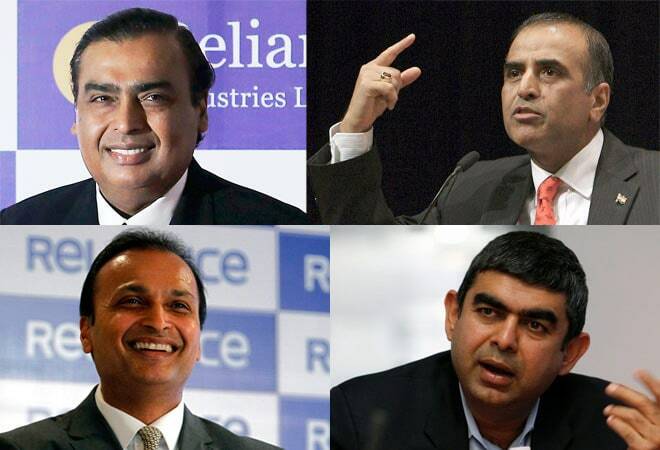 Indian CEO salaries are touching new highs as the war for talent gets fiercer. And compensation structuring is increasingly mimicking the salary innovations in the US. In July this year, India's software services giant Infosys announced that it was hiring former SAP chief technology officer Vishal Sikka as its new CEO at a compensation that could touch $5.08 million (Rs 30 crore or so) per annum including variable pay. Sikka would also be entitled to stock options to the tune of $2 million. Sikka's remuneration made headlines because - though middling by global standards - it was the highest salary that had been offered to a non-promoter CEO in the country till date. And it was vastly higher than the salary of the man who was doing the hiring. N.R. Narayana Murthy, who had given the final nod to Sikka's recruitment, was drawing a princely sum of Rs 1 per annum. Murthy had stipulated he would only accept a token salary when he agreed to come out of retirement in June 2013 and take charge as executive chairman once again. Despite the gloom and doom of the past few years, there has never been a better time to be a CEO of an Indian company. The average compensation of Indian CEOs - both promoters and professionals - has risen sharply over the past few years. In fact, in 2013/14, a year that was pretty dismal for the Indian corporate world, the CEOs of the top 100 listed companies saw their aggregate annual compensation rise by 12 per cent. The aggregate revenues of the same group of companies only rose by 9.6 per cent while profit after tax grew even slower at 6.9 per cent. A decade ago, there were barely a couple of dozen C-suite occupants who drew salaries over Rs 1 crore per annum. In 2013/14, there were 697 crorepatis in total in the BT 500 C-suites, with about 40 being added in that year itself. 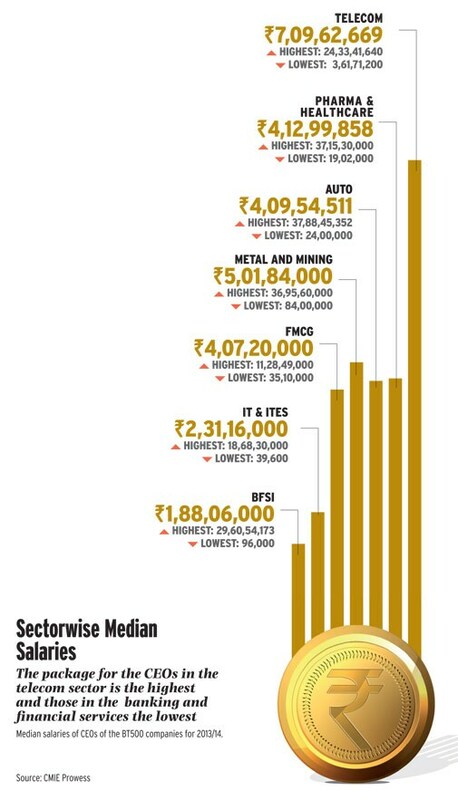 There were a dozen people whose annual salaries were well above Rs 25 crore, another 45 in the Rs 10 crore to Rs 25 crore bracket. 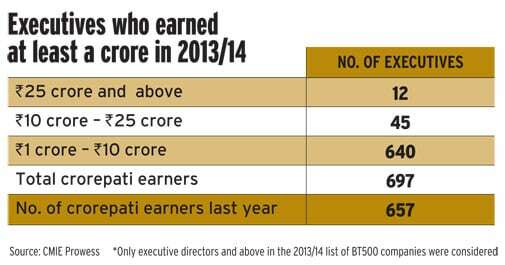 In several of the top companies, over 10 executives had compensation packages in excess of Rs 1 crore. 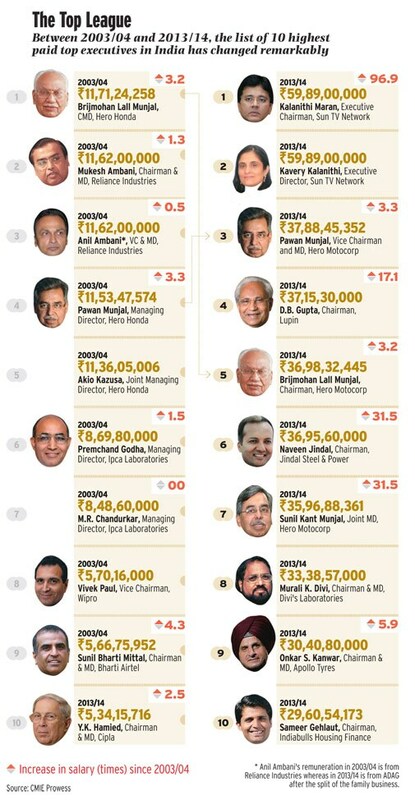 The newcomers to the crorepati club last year included people like Abhijit Roy, MD, Berger Paints India, at Rs 1.07 crore, Anupam Puri at Rs 1.1 crore and Bruce LA Carter at Rs 1.02 crore - both Directors at Dr Reddy's Laboratories. Infrastructure company Triveni Turbine has Arun Prabhakar Mote, Executive Director at Rs 2.17 crore, while Jindal Steel & Power has Dinesh Kumar Saraogi at Rs 1.31 crore. Things were not always as good for Indian CEOs. Till the early 1990s, the Companies Act capped the CEOs' salaries. Add the fact that personal income tax was considerably steeper then, and most CEOs took home salaries that were fairly modest, by any standards, even if the rupee went a lot further in those days than it does today. In 1993, changes in the Companies Act freed CEO salaries and immediately pay packages started shooting up. 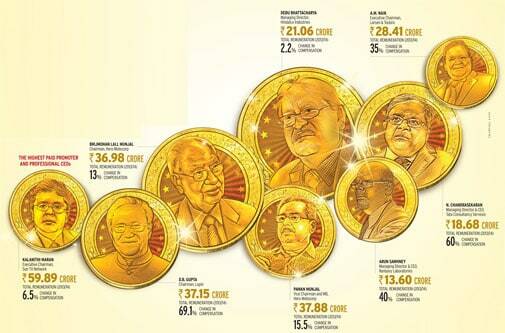 By 1994, the first CEOs with over Rs 1 crore in annual compensation had started showing up. Pradip Shah, founding MD of India's pioneer credit rating firm CRISIL was one of the earliest to cross the seven figure salary barrier. But even then, through the 1990s, the CEO crorepati club was fairly exclusive. Things started changing in the last years of the 20th century as the opening up of the economy saw new multinationals coming into the country. Meanwhile, the dotcom boom, the runaway growth of IT companies, and the rising number of new multinationals opening shop ensured that salaries doubled, tripled and quadrupled in the senior rungs. As the fight for talent grew fiercer, poaching became the name of the game. And the older multinationals in the country became favourite hunting grounds for new players looking to build a senior team quickly. Of course, poaching was always a favoured tactic of any new firm setting up operations in India even earlier. Ramesh Vangal, who led PepsiCo's entry into the country, reminisces how, in 1988, they picked up lots of talent from Hindustan Lever (now Hindustan Unilever). "SM Datta - the then chairman of HLL - met me and expressed his concern about how PepsiCo was disturbing the Indian salary structure and how this would have a bad impact on all companies," laughs Vangal. To get around the salary restrictions of those days, PepsiCo and other new players started offering perks like soft furnishing allowances, paid vacations abroad, and paid helpers. But the action had really started hotting up in the late 1990s. In 1998 and 1999, the dotcom boom was giving rise to its own dynamics. Where CEO salaries was largely fixed till the mid-90s, the end 90s saw a large portion coming by way of variable pay. The dotcoms, the software services companies and other tech companies also introduced the concept of Employee Stock Option Plans (ESOPs) and also sweat equity. The idea was to let the senior employees have some incentive that would be tied to the company's performance. When stock options first made their appearance, the traditional companies were aghast. "I remember a conversation with a promoter of an Indian group and asked him to offer stock option to a talent they were keen on hiring for launching their financial services arm. They thought the suggestion to be preposterous," says Sanjiv Sachar of Egon Zehnder, that specializes in leadership and board-level talent search. Later though, even the traditionalists gave in. "The new Indian business entities realised that no high-flier was willing to join them and the only way to woo them was to offer high stakes," says K Sudarshan of EMA Partners International, a headhunting firm. By March 2000, the dotcom boom had reached its peak and the long slide down was about to begin. The dotcom burst of 2000/01 had an impact not just on the pure internet companies but on the entire information technology sector. Suddenly, tech stocks were plunging and ESOPs were under water. It would be around 2006/07 before stock options and sweat equity would come back into favour and become mainstream. And other industries, not just technology companies, would make them part of the overall compensation package of CEOs. In 2000/01, even as tech was falling out of favour, other sunrise industries were taking up the slack. Telecom and television were two new sectors offering record salaries. ZEE Television, provoked by the success of Star Plus' Kaun Banega Crorepati roped in Rediffusion DYR's advertising head Sandeep Goyal for a salary that far exceeded Rs 1 crore. "This was also the time when professionals had quit in favour of start-ups and the banking and financial services sector, along with telecom, was taking off," says K Sudarshan of EMA Partners. People like Girish Rangan who had worked in Proctor & Gamble, Boots India and Leo Burnett crossed over to telecom for salaries upwards of Rs 1 crore. By 2005/06, CEO salaries had again begun a steep climb and the Rs 1 crore figure was passe. The new benchmark was $1 million. Some of it was simply because Indian CEOs now needed to operate in global markets as well, and this had a trigger effect on the salaries. "We in India are globally competitive in terms of CEO salaries and many have globally benchmarked salaries? a million-dollar salary is not at all unusual," says GV Prasad, CEO, Dr Reddy's. The decade also saw the rise in the salaries of promoter CEOs. As a group, promoter CEOs were in general better paid than their professional counterparts, but the salaries of promoters went up exponentially only in mid-2000. It would take the 2009 global financial bust before CEO salary growth started slowing down again. In fact, in the slowdown following the global financial crisis, many promoter CEOs took hefty paycuts. Mukesh Ambani voluntarily cut his salary by half. Naveen Jindal slashed his salary even more, and several others took pay cuts in the top rung. In 2009, the variable component of the salary for many professional CEOs also fell sharply. This was the year when people realised that variable structure was indeed variable! "This was the year of downturn and many people did not get their bonus and variable end of the salary structure," says Anita Ramachandran of Cerebrus Consultants, one of the oldest talent search firms in India. Though India Inc has consistently marched ahead on having lesser percentage of pay structures towards fixed, this was the first time their compensation was being withheld. For many of the promoter CEOs though, the pay cuts did not materially affect their income or wealth. Many promoters received dividends worth crores from their shares, and their dividend income was often vastly in excess of their salaries. Even more important, much of their wealth was derived from the value of the stock they held. Even Murthy could afford to take just Rs 1 as his salary during his comeback because his family's shares in Infosys was worth well over $1 billion. Despite the skyrocketing salaries, the overall compensation of even the highest paid Indian CEOs lag behind their US counterparts, largely because of the differences in the scale of operations. For example, Sikka may well be the best paid Indian tech CEO, but his salary is still small potatoes compared to the salaries of the top tech CEOs in the US, most of whom boast salaries (including bonuses) in excess of $30 million annually. Similarly, Wall Street and Hedge Fund bonuses completely dwarf the compensation of top Indian financial services companies. But despite the differences in amounts, in many cases the Indian compensation structuring has followed the lead of US companies. Some of this has happened because multinationals have tried to follow the same pay structures across regions. Pallavi Kathuria of Egon Zehnder, a leadership search firm, says: "The last few years has seen a clear standardization of compensation packagages, based on levels, in most multinational organisations." This means that in regions contributing to similar revenues, the stark differences in pay packages is thinning. She does put a rider though: "The difference, of course, is on the size of business and the geographical area under control," she says. Egon Zehnder points out that sometimes organisations tend to compensate new CEOs for unvested stocks and other benefits that they are leaving behind, but these differences tend to even out in three years. But at any rate, CEOs today are being sought that can have their 'skin in the game'. Here, naturally, they are given stock options, or in some cases, even put in some kind of sweat equity that get compensated when the company is listed. Here again India is miming trend of the developed markets, but not the whole hog. "We still notice that CEOs are not as willing to take a hair-cut or forgo on their fixed pay as much as those in Silicon Valley," says Kathuria. True. CEO compensation structure is moving away from fixed pay towards variable and long-term incentives (LTIs), but it is still not a vastly changed equation in the last five years. Aon Hewitt data show that in 2010 CEO salaries were structured with 55 per cent towards fixed pay, 25 per cent in variable and the balance 20 per cent being LTIs. In 2014 this mix has shifted a bit with 50 per cent being fixed, 20 per cent being variable and 30 per cent being LTIs. Also, the fixed pay has gone up in the range of 8.5-9.5 per cent and the variable pay has risen in the range of 12.5-13.5 per cent. But even with all this, the difference between salaries of Indian and global CEOs remains. While some of the old perks remain, changing tax structures and market realities have also made some old perks less attractive. Today, it is not uncommon to find CEOs who buy fancy houses in tony residential addresses on their own steam and live it up. "Earlier, companies could lure and retain talent by giving them houses. But with availability of housing loans and supply of residential properties, companies too realised they were sitting with huge real estate in their book and having to worry of maintenance," observes Anshuman Magazine, Chairman and MD (South-Asia) of CBRE, a real estate services firm. Also, signing bonuses are becoming common. "In the last year or so even Indian companies when they hire give a massive signing bonus. No senior person will jump unless there is a big bonus commensurate to your packet size," says Devraj Sanyal, MD (South Asia), Universal Music. Not just that, "There is bonus, grand slam and stock options," he says. CEOs get 100 per cent bonus if they meet the full target (bonus is usually 40 per cent of the compensation). "Every CEO and MD is incentivised to go well beyond the plan. The Grand Slam is if you hit your target numbers three years in a row then there is a big pot of gold sitting somewhere. Grand Slam is more of an anti-attrition retention tool to keep the big boys locked in so that they don't jump," he says. Golden parachutes (the hefty severance pay) that was an innovation of the US has made its way to the country as well. According to sources, two media heads have walked away this year with exit salaries of Rs 58 crore and Rs 87 crore. And with sweat equity and skin in the game, the relationship between promoters and the top professionals is also changing. Promoters such as GV Sanjay Reddy, Vice Chairman, GVK, readily acknowledge that the real concept of CEO has evolved. "They have become partners in business and is not quite like the earlier purely employee-owner relationship and, therefore, their compensation is heavily linked to their performance," he says. In fact, the promoter-employee relationship can change because of a number of factors. Take the case of A Mahendran, former MD, Godrej Consumer, who came to work for the Godrej group in 1994 when Godrej bought Transelektra. "I joined Godrej by selling my business Goodknight to them. They wanted me to run the business. I ran it on contract basis. Mine was not sweat equity, but equity that I put with cash. I participated in the equity as per the valuation," he says. This meant that he operated like an entrepreneur with a minority stake in the joint venture business. In 2010, when Sara Lee exited the venture, it was merged with Godrej Consumer Products and Mahendran became the MD of Godrej Consumer Products. He eventually exited in 2013, but still continues as non-executive director. Despite CEO salaries rising rapidly in general, not all industries tend to compensate similarly. And even though there has been a certain standardisation of structure of compensation, there is little correlation of pay packages and size of company. In theory, there should be a strong correlation between company pay and performance and the size of the company. But that is becoming less and less true both globally and in India. "Our data shows that in India, historically, the extent of correlation between these two factors has been far lower (and almost negligible) compared to developed economies," says Anandorup Ghose, Performance and Rewards Consulting Practice Leader at Aon Hewitt India. According to Ghosh, pay at the executive level here has always been driven by the incumbent than the size of the role. For instance, YC Deveshwar as Chairperson of ITC gets to take home around Rs 11.28 crore for a company that generates over Rs 48,000 crore in revenue. This is close to what Zubair Ahmed of GSK Consumer Products gets to take home - Rs 10.79 crore on revenues of Rs 5,351 crore. In the automotive segment, Pawan Munjal gets Rs 37.88 crore on revenues of Rs 27,710 crore and that is not too far apart from what Onkar Kanwar takes - Rs 30.40 crore on revenues of Rs 9,794 crore. While CEO salaries recommended by the board or compensation committees have generally tended to sail through in India, of late, there is a rising trend of shareholder activism for compensation packages which are seen to be out of line with overall performance. In July, for the first time this year, the proposal on Tata Motors was rejected and it actually turned to be an outlier in the melee. Tata Motors is the only instance that did not even get the required 75 per cent votes in postal ballot to give a bonus to the legal heir of former MD Karl Slym (who is part of our best paid professional CEO list and who died in January this year) and two other directors. Tata Motors had not posted great results and that could have been one reason for this. The Tata Motors case was unique because even the proxy advisory firms had not opposed it. "We did not oppose the proposal of Tata Motors," says Shriram Subramanian of InGovern. Despite that, it still did not get the requisite votes to go through. According to both proxy firms, Tata Motors deserved to have its proposal approved as these were executive directors and not promoters. Also, the company had sufficient profit and revenues that merited its proposal. Also, the compensation was in line with industry standards. In other cases though, salary proposals went through despite stiff opposition. In June this year, Marico faced resistance as proxy firm Institutional Investor Advisory Services (IIAS) opposed the stock option plan of Marico's new MD and CEO Saugata Gupta for 2014. Marico board sought to grant stock options of up to 0.5 per cent to Gupta. IIAS was of the view that at the then prevailing share price of Rs 237, the total cost of the scheme amounted to Rs 761 million. That was equivalent to 13.2 per cent of the financial year 2014 net profit. Also, Marico had not disclosed the period over which the company will grant stock options to Gupta. However, Gupta's compensation finally got the desired votes. Suzlon and Apollo Tyres also saw compensation challenges, though in both cases the proposals finally went through. The new Companies Act is likely to bring more changes to the CEO compensation story. "The new Act puts the onus of succession on the board. Also, it fundamentally alters the way this issue is viewed, making them accountable," says Hemant Upadhyay, Managing Consultant and Leader of Executive Rewards Practice at Hay Group India. But veteran market observers and analysts such as Prithvi Haldea are not convinced. "We have many laws. A company that wants to follow the law will do so. Those wanting to flout them will find loopholes," he says.